Visual Analysis of Multiple Route Choices Based on General GPS Trajectories, IEEE Transactions on Big Data, 2017, 3(2): 234-247. Interactive Visual Discovering of Movement Patterns from Sparsely Sampled Geo-tagged Social Media Data, IEEE Transactions on Visualization and Computer Graphics (VAST'15), 2016, 22(1): 270-279. Exploring OD Patterns of Interested Region based on Taxi Trajectories, Journal of Visualization, 2016, 19(4): 811-821. TrajRank: Exploring Taxi Travel Behaviour on a Route by Trajectory Ranking, In Proceedings of IEEE Pacific Visualization Symposium (PacificVis'15), pages 311-318, Hang Zhou, April 14-17, 2015. OD-Wheel: Visual Design to Explore OD Patterns of a Central Region, In Proceedings of IEEE Pacific Visualization Symposium (PacificVis'15), pages 87-91(Notes), Hang Zhou, April 14-17, 2015. Visual Analysis of Uncertainty in Trajectories, in Proceedings of Pacific-Asia Conference on Knowledge Discovery and Data Mining (PAKDD'14), pages 509-520, Tainan, May 13-16, 2014. Route Visual Analytics and Interactions based on GPS Trajectories, PhD Thesis, Peking University, 2017. Visual Analysis of Sparse Urban Vehicle Trajectory Data, Master Thesis, Peking University, 2017. 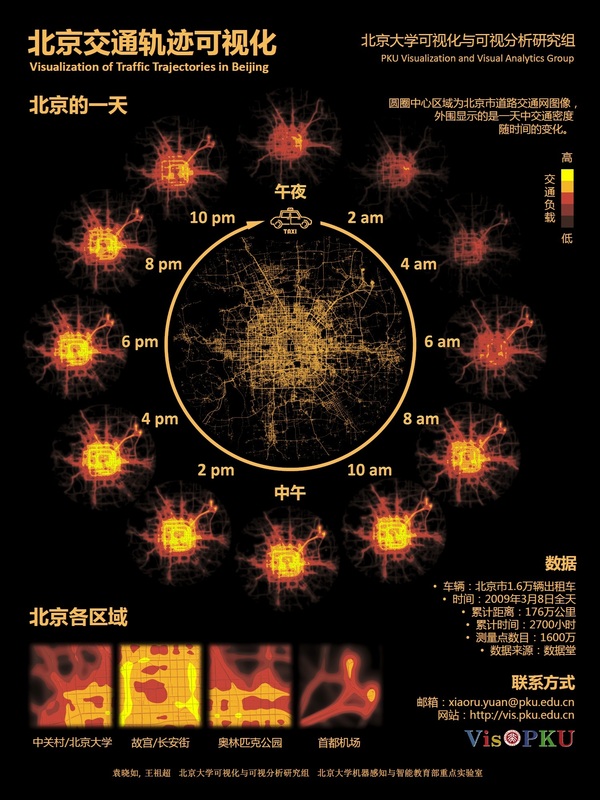 Visual Data Cleaning and Event Analysis of Urban Vehicle Trajectory Data, PhD Thesis, Peking University, 2015. Filter in Visualization of Geospatial Data, Journal of Computer-Aided Design & Computer Graphics , 2016, 28(5):702-711. Urban Trajectory Timeline Visualization. in Proceedings of International Conference on Big Data and Smart Computing 2014, Bangkok, January 15-17, 2014. Visual Analysis of Route Choice Behaviour based on GPS Trajectories, IEEE VIS 2015 (Poster),, Chicago, Illinois, USA, October 24-30, 2015. Discovery Exhibition: Visual Analysis on Traffic Trajectory Data. IEEE Visualization Conference 2011 (Discovery Exhibition Poster), Providence, RI, USA, October 23-28, 2011. Interactive Visualization of 160 Years’ Global Hurricane Trajectory Data. IEEE Pacific Visualization Symposium (Poster), Hong Kong, March 1-4, 2011.